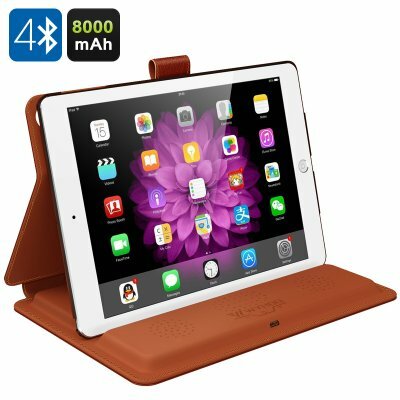 Successfully Added WYHOO 3-in-1 iPad Case - Protective Case, 8000mAh Power Bank, BT Speaker, For iPad Air, Air2 (Brown) to your Shopping Cart. Your iPad Air or iPad Air2 is a great, but fragile device. That’s why it’s always recommended you have a reliable case to protect it from occasional drops and scratched. But why just get a case, when you can get a gadget that comes with 3 features in one? Yes, the WYHOO iPad case will give your gadget protection, power and great sound. The 3-in-1 gadget looks like an elegant leather notebook, while hiding lots and lots of great functionality. A stylish case for your iPad, it can also be used as a stand – so that you can display and work with your gadget in comfort. Case: the WYHOO iPad case is specifically designed for you iPad Air or iPad Air 2 and comes with custom-made protection and precise cut-outs. Made with soft PU leather, it won’t only provide a buffer for you iPad in case of a fall, but will also give your gadget a nice and elegant look. A magnetic buckle on the case lets you easily close it up and open whenever needed. 8000mAh Power Bank:The 3-in-1 case comes with a built-in 8000mAh power bank. With double the capacity of your iPad Air or iPad Air2, you can conveniently recharge your gadgets on the go and always have a backup ready in emergencies. Bluetooth Speaker: If you would ever want your iPad to get a tad louder, that also won’t be a problem with the WYHOO iPad case. It comes with two 3W built-in speakers with bass resonance, giving you great stereo sound quality for all your music tracks, audio files and more. The WYHOO 3-in-1 iPad Case comes with a 12 months warranty. Brought to you by the leader in electronic devices as well as wholesale iPad cases..